The family-friendly, warm and inviting environment here at Healing Path of Rockford will make you feel right at home. The environment of the office is focused on learning and healing and questions are always welcomed. From patients mingling in the waiting area to kids interacting in the kids corner to our caring staff who look forward to interacting with you, this is an energizing place to be. Before your first visit, you can access the necessary paperwork by downloading below. We can also email the forms to you, or you can come in early and complete them. Please bring your insurance card and ID with you. To become acquainted with the office, we will give you a tour of the office and show you the therapies that we offer and where they’re located. During the tour, you’ll also learn about the various things that Chiropractic can help. Dr. Leonard will meet with you to address your concerns and take a comprehensive history to determine what exams will be performed that day. When the consultation has concluded you will be shown to the examination room where a thorough orthopedic, neurological, physical exam will be performed. This includes state of the arc technology which will include computerized Static sEMG (surface electromyography) and Thermography scans. If necessary, digital X-rays will be taken. Proper shielding and caution is used when utilizing x-rays. The use of digital x-rays allows for less radiation, making x-rays safer for patients and less wait times. After the exam, you can schedule your next visit at the front desk. Your first appointment will take approximately 45 minutes. When you return for your second visit, we will review in detail everything that we did, including the results of your X-rays and MyoVision scans. We will discuss what type of care you need and let you know the expected costs. At this visit, you will also receive an adjustment. This appointment takes 30 minutes. You will be given a booklet that contains all information from office information, your exam findings, the Myovision scans, x-ray findings, treatment recommendations/expectations and cost projections so you can take control of your health knowing all the facts up front. We are here to help you and are able to accommodate time, travel and financial concerns. Do You Have to See a Chiropractor for the Rest of Your life? No. However people who experience Chiropractic recognize the health benefits and choose a lifestyle that includes lifelong Chiropractic care. If you started to exercise today, for how many years would you need to continue exercising in order to maintain a good level of fitness? If you started to eat healthy today, for how many years would you need to continue to eat well in order to maintain a healthy figure and healthy digestive system? If you slept for 24 hours tonight, could you stay up for the next three days, and still feel great and be healthy? So, truly, the answer to this question must come from each individual’s decision on whether or not they feel it is an important part of their healthy lifestyle. That decision is ultimately up to you. Patient education is a big part of what we do here at the practice. 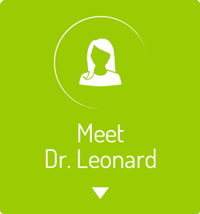 Dr. Leonard provides free health talks to the community, in-house events and workshops that teach tips and tricks on how to stay healthy. Look for her in the community and at health events where she will be spreading the word about the power of safe and natural Chiropractic care! Experience quality Chiropractic care in our warm and friendly environment. Contact us today to schedule an appointment!